Silly Bandz are the latest craze for kids. These cheap rubber bands come in many different shapes. Wal-Mart and other stores are now copying the idea and making them MORE CHEAP! Here are some Pros and Cons for Teachers Using Silly Bandz in the Classroom. Inexpensive reward for positive behavior. Your kids will be drooling over these and will do whatever you ask to get one. 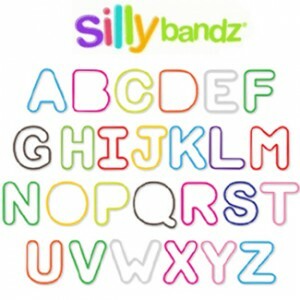 Use the Alphabet Silly Bandz for Preschool and Kindergarten to learn the alphabet. Use them in a teaching lesson for grouping, compare and contrast, writing prompts, etc. Your kids are sure to be engaged in the lesson! Use them as a classroom behavior method. Buy one pack of Silly Bandz, then students must earn one Silly Band at a time to eventually earn an entire set of Silly Bandz to participate in a special activity. Your school may not allow Silly Bandz, and your kids may not be allowed to wear them. There is a slight risk that they may cut off hand circulation. Silly Bandz could end up being a distraction to learning. It could become more about Silly Bandz than about learning. Will Silly Bandz have a positive or negative result in your classroom? You Decide! If you want to get Silly Bandz, Click Here for a large selection. This entry was posted by Free Worksheets on July 11 at 8:00 am, and is filed under Behavior, Discipline. Follow any responses to this post through RSS 2.0. Responses are currently closed, but you can trackback from your own site.